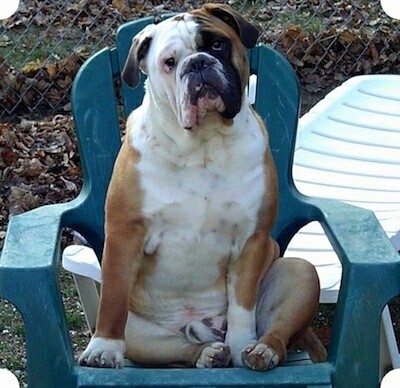 The EngAm Bulldog is not a purebred dog. 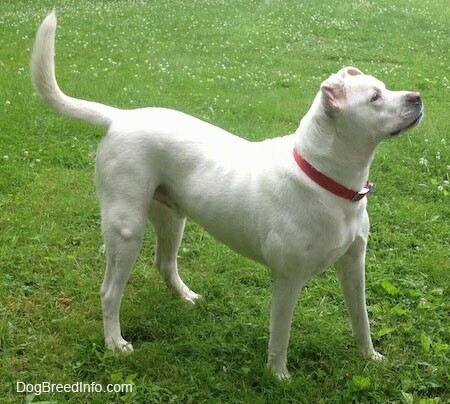 It is a cross between the American Bulldog and the English Bulldog. The best way to determine the temperament of a mixed breed is to look up all breeds in the cross and know you can get any combination of any of the characteristics found in either breed. Not all of these designer hybrid dogs being bred are 50% purebred to 50% purebred. It is very common for breeders to breed multi-generation crosses. "This is Bucksnort II-a Stitch in Time, mostly referred to as Stitch. Stitch is an English / American Bulldog. 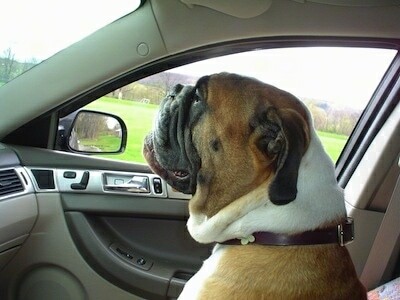 His mother was a white English Bulldog, and his father was a fawn American Bulldog. He is 1 year and 6 months old in this picture, weighing 60 lbs. and standing 16 inches at his shoulders. 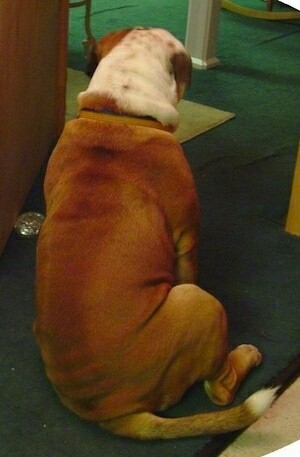 Stitch, as most Bulldogs are, is very stubborn and headstrong. If you give him an inch, expect to be taken a mile. I got Stitch when he was about 12 weeks old and he was the most terrible dog I'd ever encountered, but with a lot of time and intensive training he is the best dog I've ever owned and I will never own any other type of dog. He loves pineapple and oranges, he hates cigarette smoke and cheap beer—yeah, he only drinks Warsteiner and Red Stripe...how bizarre." 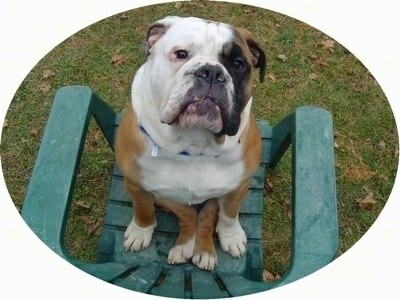 "Rocko, shown here at 5 months old, is an Eng / Am bulldog hybrid (first generation). He is mostly white, with brindle patches on his head, arm, back and legs. He has tons of black spots under his belly. His mother is a 70-lbs English purebred, while his father, an American, weighs just under 80 lbs. We were told by the breeder, who owned both dogs, that his grandfather weighed 90 lbs.!! At 5 months, Rocko already weighs 50 lbs. He is very playful and extremely affectionate. He loves to cuddle and be held like a baby. He loves to take baths, and if I don't close the door, he might just surprise me by jumping in! He is intelligent, loyal and VERY stubborn. He only does what he wants and nothing more. He wants everyone's attention and plays well with kids and other animals. His "brother" is a Chow mix and they play morning, noon, and night (though Rocko needs to take naps in between!) He eats too much, tears up my house, chews on my shoes, and occasionally plays too rough, but at the end of the day, when I am lying in bed with him snoring at my side, it's all worth it!" "Amos Moses is my Bully and the best dog on Earth! 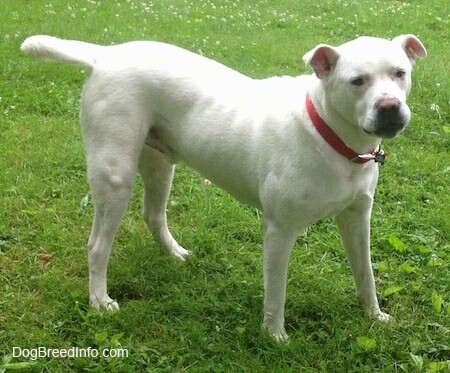 His mom was 100% American Bulldog, solid black and weighed in at 120 pounds. His dad was 100% English Bulldog and weighed in at 90 pounds. Sitting in the chair and at 10 months old he weighed 90 pounds. He got up to 120, but broke his hip when he bit a moving truck. He is fully recovered now and weighs in at 90 pounds. He still wants to bite the tires of anything that moves! Other than that he's a GREAT Bully!" "Famous Amos Moses has a father who is purebred English Bulldog and an American Bulldog for his mother. We got Amos from a family in Corning, NY, who had a four-puppy litter. We brought him home when he was 7 weeks old and he just turned 9 months and weighs in at 85 lbs I walk him 1-3 miles a day, weather permitting, and he never wants to stop. When we get inside he promptly drinks a lot of water. He goes through almost 2 gallons of water a day. He is a gentle giant and afraid of his own shadow. He would never hurt a human being since it is not in his nature. That being said, he is an excellent guard dog and very frightful to look at. His bark sounds like a Mastiff's and is deafening. He was extremely easy to train and has never had an accident indoors. He loves to play with the laser light to exhaustion and loves to rip and shred stuffed animals. Squeaker toys end up destroyed in minutes, sometimes seconds, and he proudly displays the internal squeaker to you in his dripping mouth. He knows the word “wipe” well and will bow his head after drinking so we can remove the excess water. He will eat almost anything and is simply a joy to behold. Everyone who sees him falls in love and wants to adopt him. We love Amos dearly and he is a welcome addition to our family." 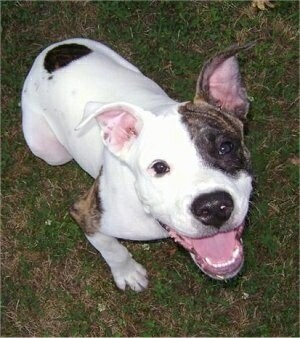 Cotton the English American Bulldog at 6 months and about 40 pounds— "Her mom was an American Bulldog (60 lbs.) and her dad was an English Bulldog (45 lbs.)." Jiggly Pop the EngAm Bulldog at one day old with her littermates— "The mother is a purebred American Bulldog and father is a purebred English Bulldog." 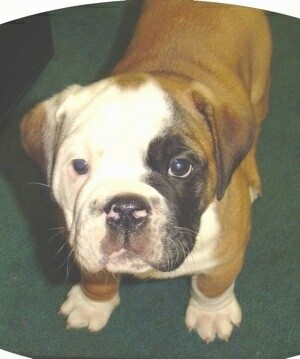 "Jiggly's older brother and sister, who are both EngAm Bulldogs. 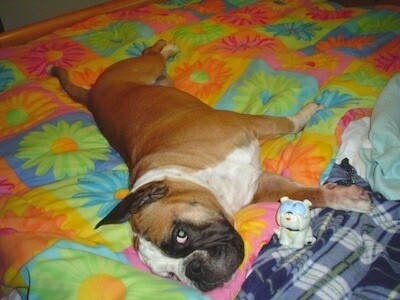 They have the same mother, a pure American Bulldog, but a different father, who is a pure English Bulldog also."